This custard is only made with egg yolks, honey, and coconut milk. Once the custard has cooked, coconut oil is whisked in and vanilla extract is added to flavour it. In total you only need five ingredients to make it. It’s also naturally dairy-free. It’s a family favourite I’ve been making a lot lately. I shared it once before here, as a video, but I think it’s time to feature it again. We usually eat it with fresh, sliced strawberries (we have it with other fruit sometimes such as raspberries, sliced, ripe pear, or ripe banana). I’ve found it to be quite versatile for a variety of uses as well such as this frozen custard/yogurt style dessert. Use a handheld blender to puree frozen fruit, such as strawberries, and a small amount (around a couple or a few dolloping spoonfuls) of custard until smooth. Eat immediately! This used to be my brother’s equivalent to Yogen Früz, as it was closest in consistency, when we were SCD. 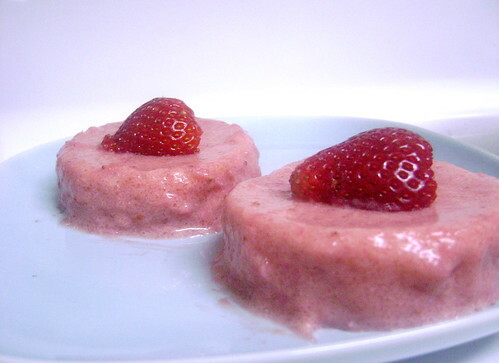 I’ve also used this custard to replace yogurt in a recipe, such as in this strawberry mousse (above) and in some baking recipes. Last but not least, if you take flavoured fish oil, such as Nordic Naturals, and it’s in a bottle (not capsules), this custard is a great way to make the medicine go down. Even when flavoured, fish oil can be hard to take on its own. Stir in your daily amount of flavoured fish oil into a serving of custard and eat it with some fruit of your choice. The thickness of the coconut milk contributes to the thickness of the custard in addition to the egg yolks. Sometimes the custard will have hardly thickened at all, even after it’s completed its cooking time. I’ve had this case scenario many times. If this is the case, rest assured there is nothing wrong. I know the natural impulse could be to grab the cornstarch or try to find something else to thicken it, but in this case all that’s required is a little refrigeration. Once you’ve added the coconut oil and vanilla and it’s cooled enough, cover it and chill in the fridge – it will thicken. Chill it for a few hours or overnight; how much it thickens depends on how long you leave it in the fridge. After two days, the custard thickens to a spreadable consistency. Whether you use five or six egg yolks doesn’t affect the custard overall; depending on the amount, when doubling the recipe use eight to ten or twelve egg yolks, and so on. It isn’t exact math, but these are the amounts of egg yolks I have used when doubling the custard. I know this may sound confusing, but sometimes I have fallen short of one or two yolks and in my experience this small difference doesn’t affect the overall outcome of the custard. I’m not always precise in my measurements when making this custard recipe. The egg yolks’ colour can also affect the colour of the custard – while usually a pale yellow, if you are using egg yolks that are a darker colour, such as orange, the custard will be a similar colour. Sometimes I’ve made custard that is a creamy off-white in colour. A different, neutral oil can be used instead of the coconut oil such as grapeseed oil. Heat a few inches of water in a small saucepan over medium heat until it comes to a gentle simmer. Beat the egg yolks and honey together in a stove-proof bowl. Add the coconut milk. Set the bowl over the saucepan, being sure the bottom of the bowl doesn’t touch the water. Remove from heat and whisk in the coconut oil, pouring it in a steady stream. The custard and oil will separate but keep on going; as you continue it will gradually smooth out. Add the vanilla and cool. Cover and chill in the fridge until ready to serve. Serve the custard in bowls with the prepared fruit. This looks wonderful! I saw “Coconut” and I had to look further! Oh my gosh that looks so delicious! it sounds so yummy! thanks for sharing! Wow, that looks soooo good! Yum!